Where would we be in life without a TomTom? Diffusing countless arguments between husband and wife on the motorway and ensuring we get to our destinations faster, TomTom is now helping us get to the golf hole quicker with its new "Golfer" GPS watch. 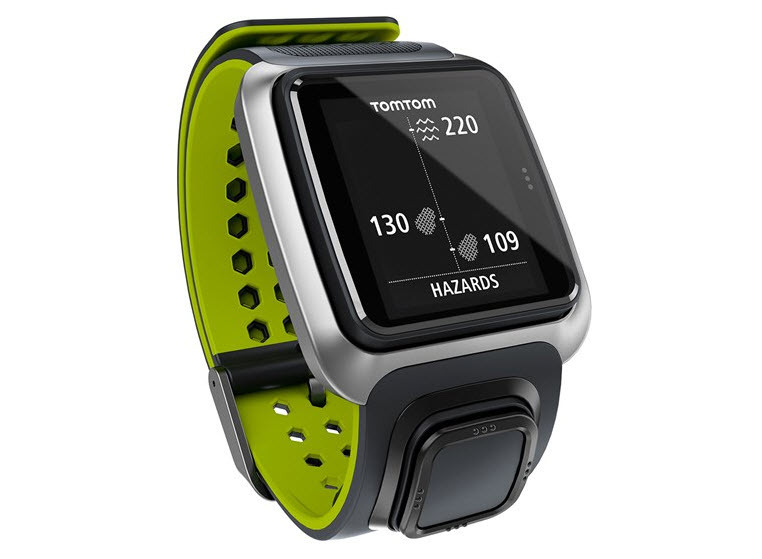 Pre-loaded with more than 34,000 international courses, TomTom Golfer is a light and slim GPS watch that paints a picture of what lies ahead of you with unique green and hazard graphics. The TomTom's dual strap fastening mechanism ensures comfort, while the square aluminium frame housing a 1.3" LCD display catches the eye. The beauty of a golf GPS watch, for most amateur golfers at least, is that within a glance of a wrist you know what exactly is required to find the front, middle and back of the green. While pin-point laser rangefinders and fancy portable handheld devices are all well and good, many of us are not able to hit "to the yard" and so we want a yardage that is quick and easy to access. Not to mention, it speeds up play, something we all know the importance of in 2015. Another nice touch with TomTom Golfer is that it displays distances to dog legs and lay-up points. Other neat features to TomTom Golfer include a one-button control that allows the user to navigate through the menus - although we find this takes some time in comparison to other premium GPS watches - and an extra-large display to see real-time course information at a glance. Pleasingly, there was also no glare noted on the screen while out in the sun. It also comes with round tracking to keep note of your score, distance and time of the round, and wireless daily course updates sent to your smartphone. The TomTom Golfer GPS automatically catches the eye in both its sleek grey or white colour options. It feels very comfortable on the wrist and does not restrict the swing in any way. All the yardages you need are there at the glance of a watch and the whole process from arriving at your ball takes a couple of seconds - you do not get that with a laser rangefinder or handheld device, as you fiddle around with your bag. If you are heading out to play once a week, the TomTom Golfer will see you safely through with no need for charging. A superb first addition to the TomTom Golf GPS family and well worth a look at £200 - about right in today's premium golf GPS market.